After some good showers last week, there was a growth spurt in the garden and the spinach in particular seemed to have ballooned. Thus, I ended up with a bucket of spinach. The leaves I cooked in the water left on the leaves after washing, in a big pot. 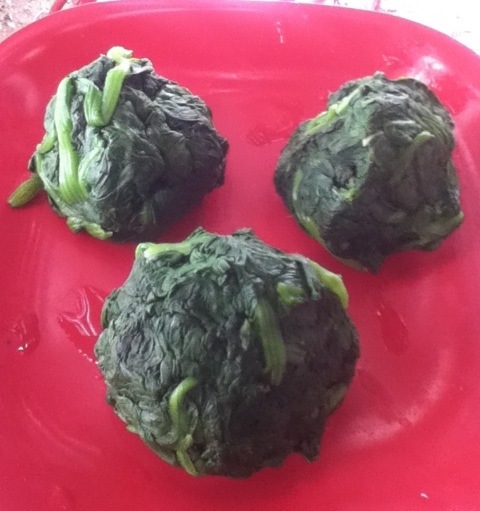 I squeezed the water out and made them into balls because my mother taught me that you can never go amiss by having cooked spinach at hand. That left the bottoms. 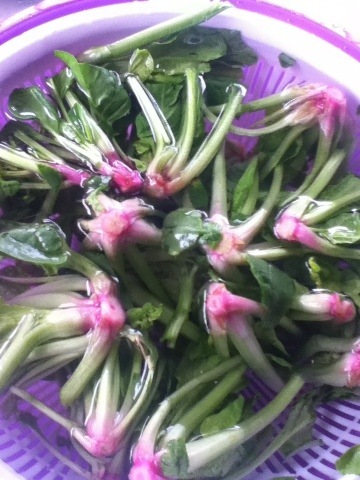 This is a part of the plant that Turkish cuisine treats quite lovingly. It is part of the great category of dishes known as olive oil dishes. I am always hesitant to wander into this territory, as I have a very capable cook as a mother in law, and an unreservedly critical audience in my husband, but with the help of both of them and a good friend, I was able to brave it. So for anyone out there with spinach to consume, here’s something you can do with all those tail ends once you’ve dispensed with the leafy bits. Then comes a crucial step. You’ve got to dry them really well. You can put them in a salad spinner or shake them out, or even towel dry them, but get the water off those ends! My mother in law even recommended squeezing them out. Add the spinach ends and stir. Cover it to let it steam a bit in its own moisture, but keep lifting the lid to give it a stir once in a while. Stems are sturdy things, so it will take about ten minutes for them to cook properly. My husband’s (curtly delivered) advice, “lemon juice,” is equally instructive: squeeze a bit of lemon over the top before serving, for a sparkly flavor. 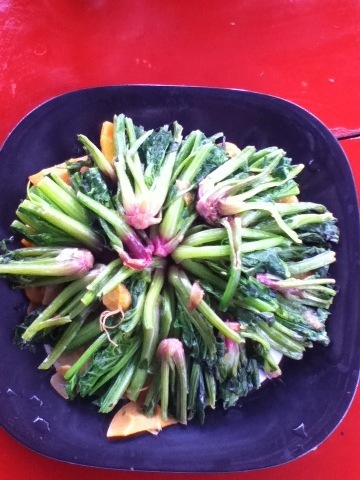 The result is a lovely, simple dish that tastes like the very essence of the vegetable, which, I suppose, it is. Let it be fodder for your cookbook! I’m so glad! Spinach bottoms are unjustly overlooked. I hope you’ll enjoy them- I know I do. I’ve never even heard of spinach bottoms being used. Great post! Now this is what a call a spinach post – so so good. i love the advice about the bottoms (I am blushing at all the ends I have thrown away). I will be trying this tomorrow with the next kg. So glad to have found this blog, good things! Welcome! I look forward to looking over one another’s shoulders. Brilliant post and very timely as our Spinach is now really growing well. Usually chop the stalks up and add them to the leaves but I love this way of using them. Thanks too for subscribing – hope you continue to enjoy!